Stephone Anthony (born July 28, 1992) is an American football linebacker for the New Orleans Saints of the National Football League (NFL). He played college football at Clemson. A native of Polkton, North Carolina, Anthony attended Anson High School, where he was a four-year starter. Anthony had 123 tackles, 16 tackles for loss, four sacks, and two interceptions as a senior in 2010. In addition to football, Anthony was also a catcher on the baseball team and a power forward on the basketball team, as well as a track athlete (11.3 s in the 100m). Regarded as a five-star recruit by Rivals.com, Anthony was rated the No. 3 outside linebackers prospect. He chose Clemson over UNC, Florida, and Virginia Tech. He appeared in all 13 games in 2011, including three starts. For the season, he registered 32 tackles, six tackles for loss, two sacks, a pass breakup, and a team-high two caused fumbles in 292 snaps. He started seven of 13 games as a sophomore, recording 77 tackles, one sack and an interception. Anthony started all 13 games as a junior in 2013. He recorded a team-high 131 tackles with four sacks and an interception. Anthony was selected in the 1st round (31st overall) of the 2015 NFL draft by the New Orleans Saints. He recorded his first sack October 4th in the Saint's 26-20 win over the Dallas Cowboys. In a Week 3 game against the Carolina Panthers, Anthony was fined $17,363 for his hit on wide receiver Devin Funchess. During the Saints' Week 12 matchup also against the Carolina Panthers, Anthony stopped running back Jonathan Stewart after a handoff up the middle, stripped the ball, then ran it back for a touchdown. Nobody chased him as everyone assumed the play was dead. In the same game, Anthony also became the first person in NFL history to return a blocked kick for two points after Kevin Williams blocked an extra point, following a rule change that took effect in the offseason to allow such returns. Anthony recorded his 100th tackle in a Week 15 game against the Detroit Lions, where he also forced a fumble. 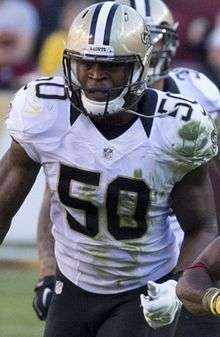 He became the first Saints' rookie to record 100 tackles in a season since Hall of Fame linebacker Rickey Jackson. Anthony finished his rookie season with 112 tackles, one sack, one interception, and two forced fumbles. He had two scores, both coming against the Carolina Panthers, and led all rookies in tackles. Anthony was also named to the Pro Football Writers Association all-rookie team. ↑ "Outside linebackers 2011". Rivals.com. January 20, 2011. ↑ "Saints get C- for drafting Anthony". cbssports.com. April 30, 2015. Retrieved March 14, 2016. ↑ "Stephone Anthony fined". NOLA.com. October 5, 2015. Retrieved February 8, 2016. ↑ "Anthony named to PFWA all-rookie team". Nola.com. January 19, 2016. Retrieved March 14, 2016.